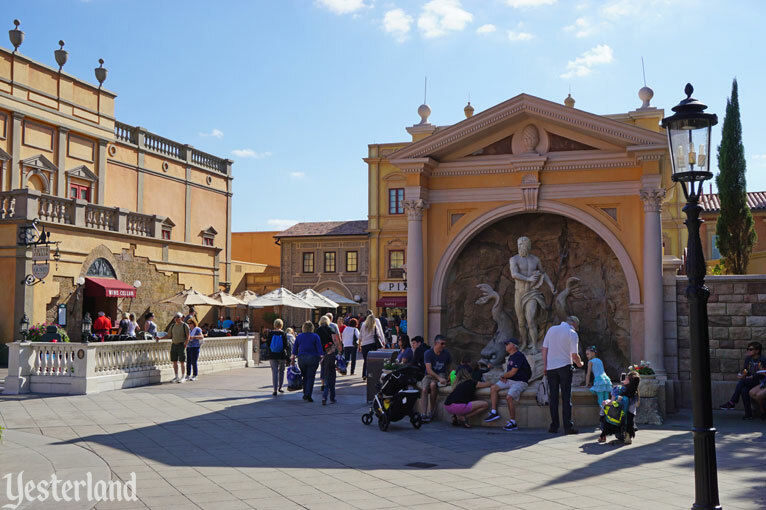 Earlier this year, a Yesterland article—“Venice, Italy & Epcot’s Italy”—showed that many features of the Italy pavilion at World Showcase are closely modeled after real landmarks in Venice. 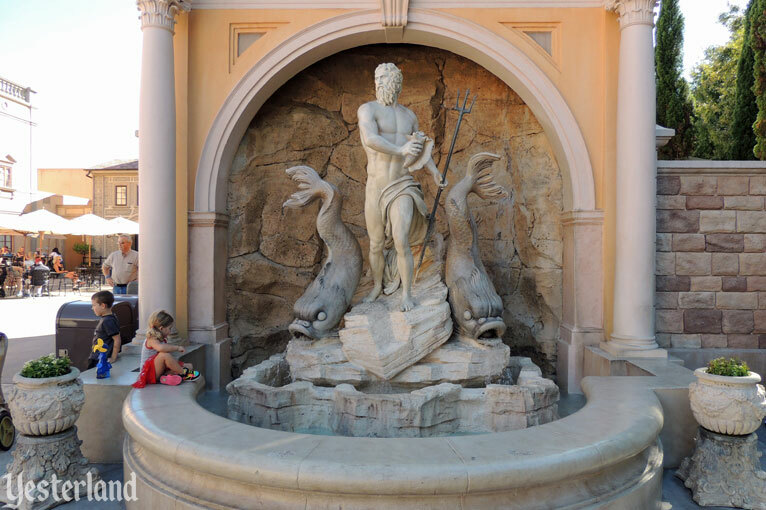 In that article, one feature of Epcot’s Italy was conspicuously absent—the magnificent Neptune fountain. Surely, it’s a replica of a real Italian fountain, right? Perhaps just not in Venice? The answer is that it’s not a replica. However, it’s inspired by Italian sculptures and fountains. I took photos of the fountain at Epcot, while Yesterland photographer Chris Bales sought out works in Rome that inspired it. , Curator of Yesterland, April 21, 2017. This photo journey begins at Epcot. Disney calls the fountain at the Italy pavilion Fontana Di Nettuno. That’s Italian for Neptune Fountain. There are usually guests hanging around the fountain. It helps that there’s bench-like seating on the edge of the fountain and that the structure provides shade. The splashing water makes it seem cooler and quieter than it really is. 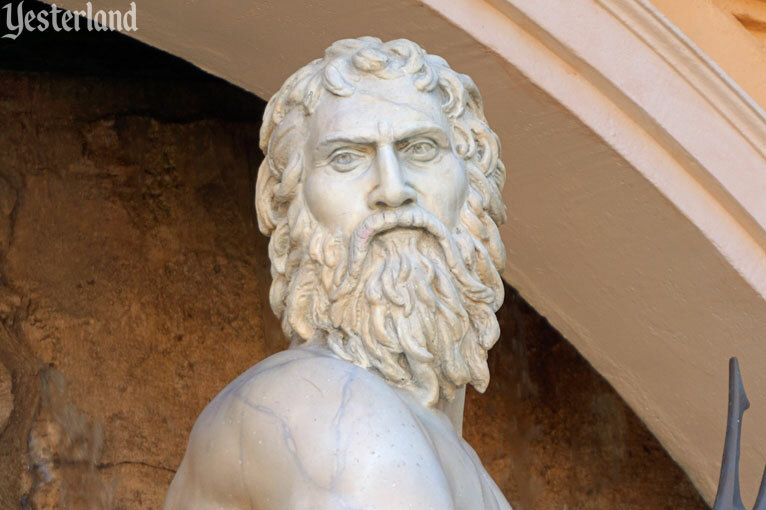 Neptune, the Roman god of freshwater and the sea, stands on a rock in a rock-lined alcove. He holds a trident in his left hand and a conch shell in his right. With a full beard, well-toned muscles, and just enough cloth to provide essential coverage, he’s a striking figure. There’s a dolphin on either side of Neptune. 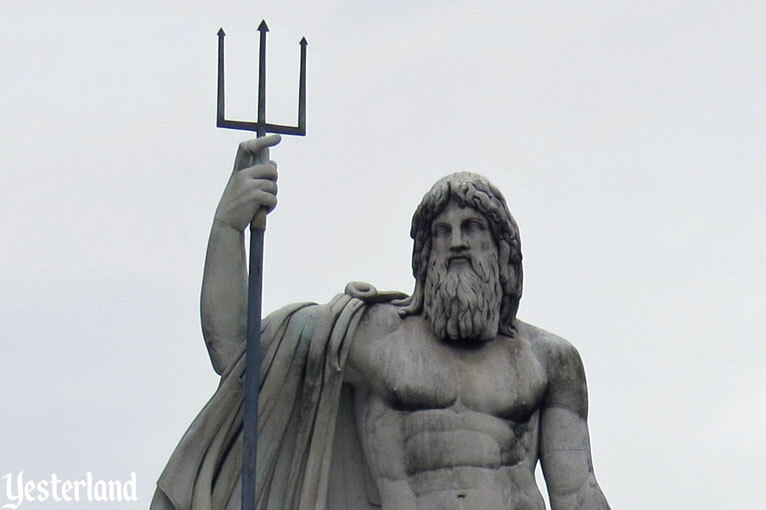 A trident is a three-pronged fishing spear that has long been associated with gods of the sea. 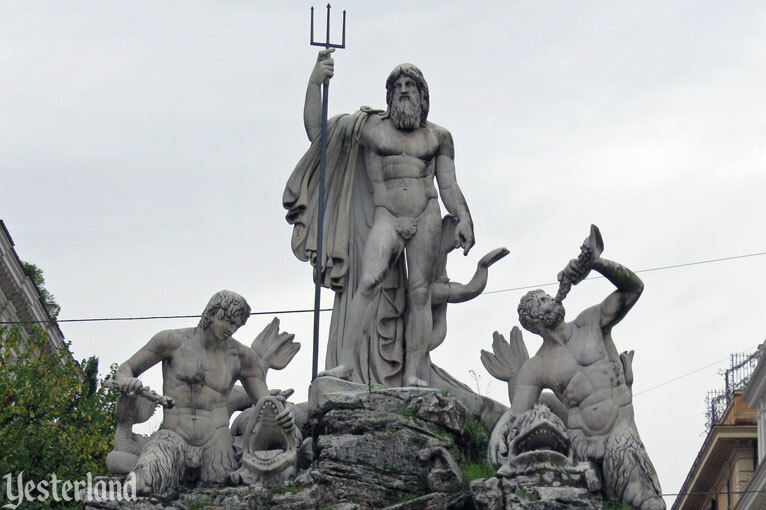 Poseidon, the Greek god of the sea, used his trident to launch earthquakes. Amphitrite, the Greek goddess of the sea, had her own trident. Their fish-tailed son Triton, the Greek messenger of the sea, sometimes also carried a trident, but is more closely identified with a conch shell. Triton would use the shell as a trumpet to control the ocean waves and otherwise assert his will. 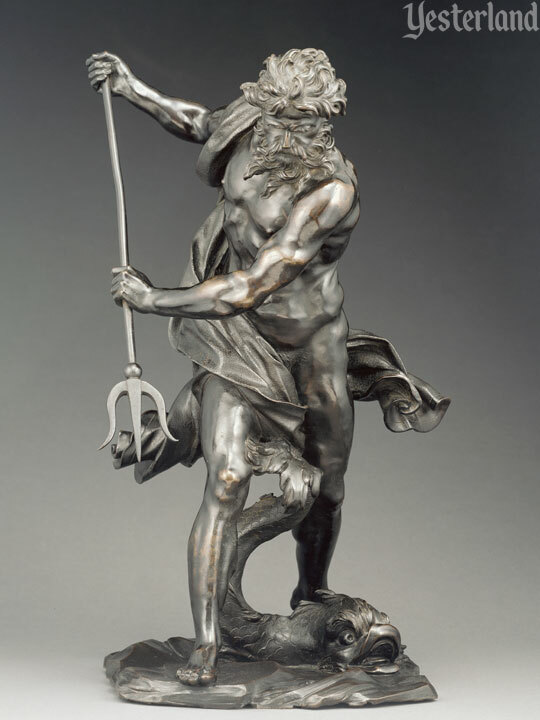 Neptune is the Roman counterpart of Poseidon. At Epcot, Neptune has a conch shell, even though that’s really Triton’s instrument. Artistic license. Aside from misidentifying Bernini as from the Renaissance, it’s good information, confirming that it’s not a replica, but that its similarity to masterpieces of Italian sculpture is intentional. With these clues, we’re almost ready to visit Rome. 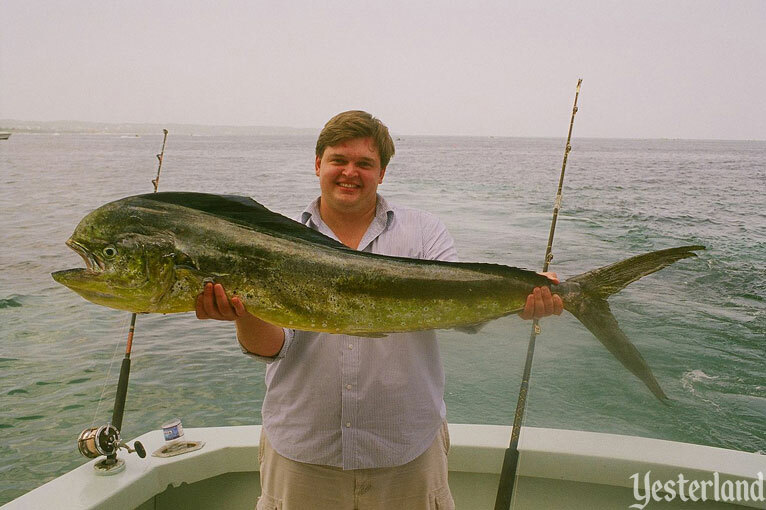 First, this photo journey stops on a fishing boat to answer a question that might be puzzling some readers. Why don’t the sculpted dolphins look even remotely like the performing dolphins at SeaWorld? It’s because the fountain’s stylized dolphins are fish—also known as dolphinfish, mahi-mahi, and dorado. They don’t look like the aquatic mammals because they’re unrelated. It’s a confusing case of two ocean-dwelling species with the same name. 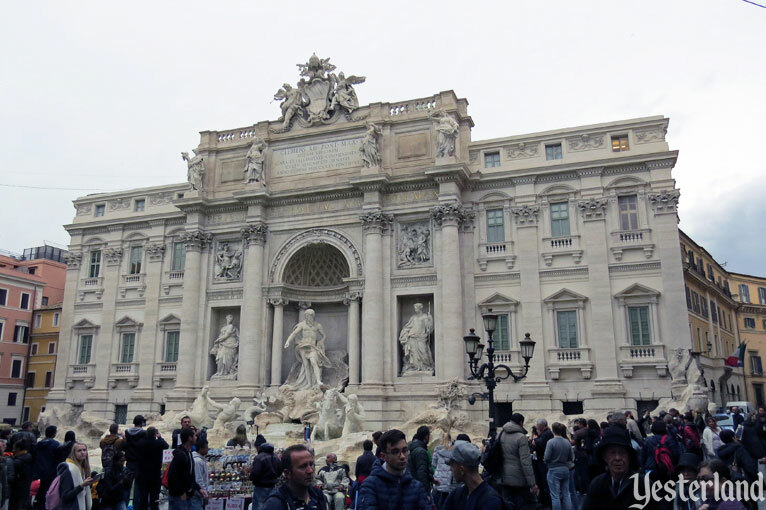 Our first stop in Rome is Trevi Fountain (Italian: Fontana di Trevi). It’s so famous that it even has its own official website. How many other fountains have that? The website notes, “It is the largest Baroque fountain in the city and the most beautiful in the world.” It attracts throngs of tourists. As its title suggests, the movie Three Coins in the Fountain (1954) provided reasons to toss in two additional coins: The second would lead to a new romance and the third to marriage. No trident. No conch trumpet. No dolphins. Although there’s a resemblance between Disney’s Fontana Di Nettuno and Rome’s Trevi Fountain, the former is not a “shrink and edit” version of the latter. 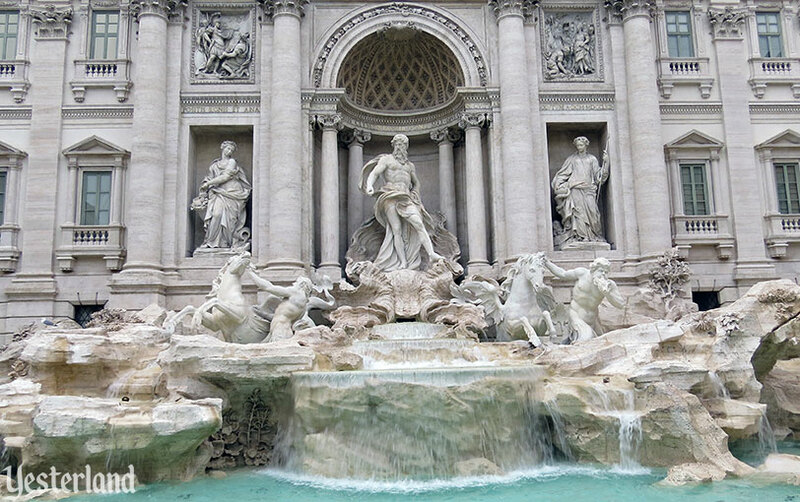 Many travel books and websites identify the central figure of the Trevi Fountain as Neptune, but that’s incorrect. It’s Oceanus, yet another classical deity of the seas. That’s why Neptune’s trident and dolphins, as well as Triton’s conch trumpet, are all missing. 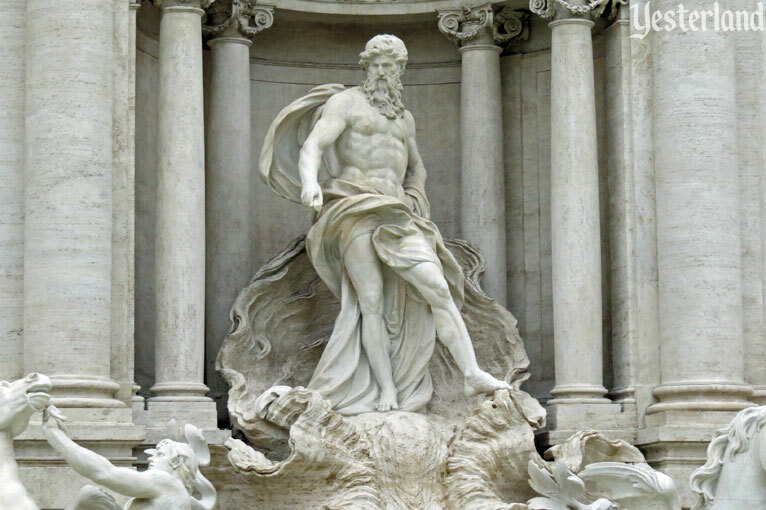 Also, Oceanus was sculpted by Pietro Bracci (1700–1773)—not by Gian Lorenzo Bernini (1598–1680), who is credited as the inspiration for Epcot’s Italian fountain. 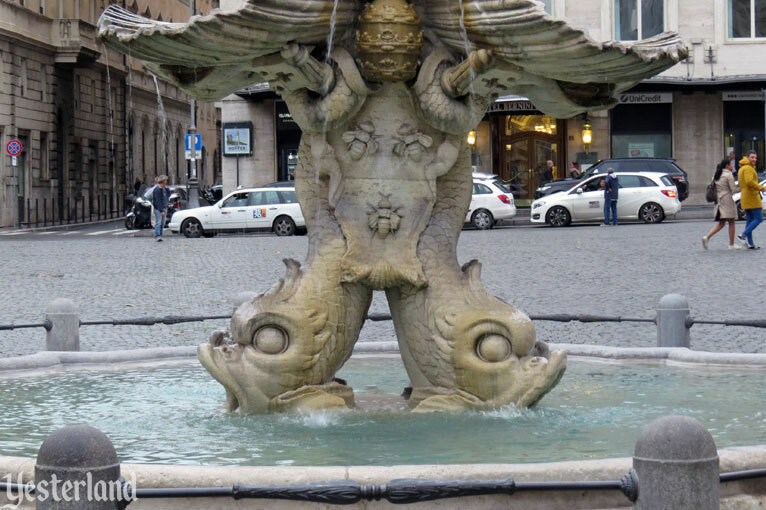 Our next stop will be a fountain that actually features Neptune, although not sculpted by Bernini. 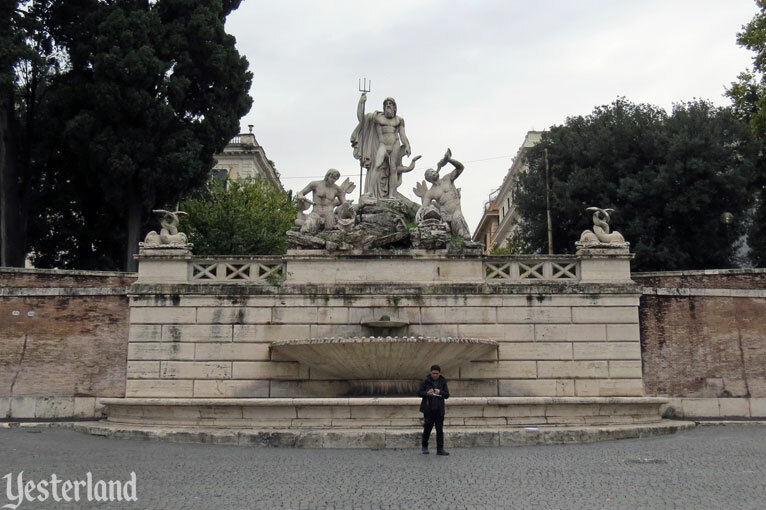 Fontana del Nettuno (Fountain of Neptune) is located at Rome’s Piazza del Popolo (People’s Square). This time, the deity is Neptune. As at Epcot, he has his trident and is accompanied by dolphins. Twin Tritons hold the dolphins. One Triton is blowing a conch trumpet. This Fontana del Nettuno is the work of sculptor Giovanni Ceccarini (circa 1790–1861). Our final stop in Rome will be an actual Bernini work—but not of Neptune. 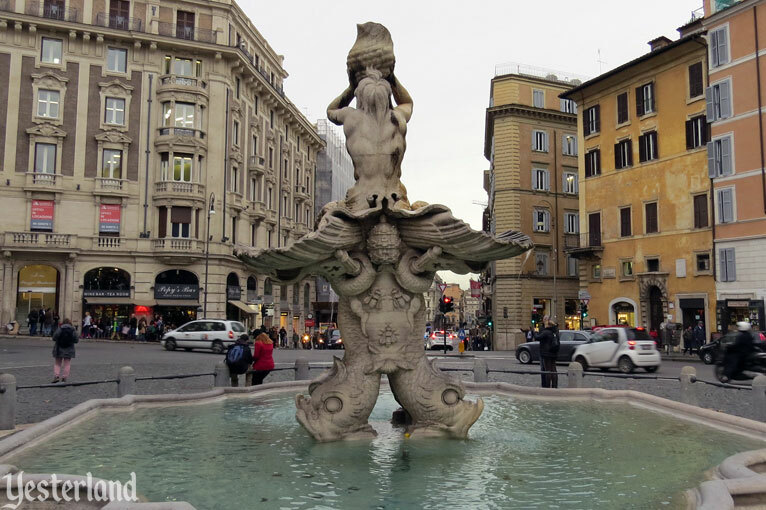 Fontana del Tritone (Fountain of Triton) is in the center of Piazza Barberini. Finally, we have a work by sculptor Gian Lorenzo Bernini—the official, documented inspiration for Epcot’s Italian fountain. 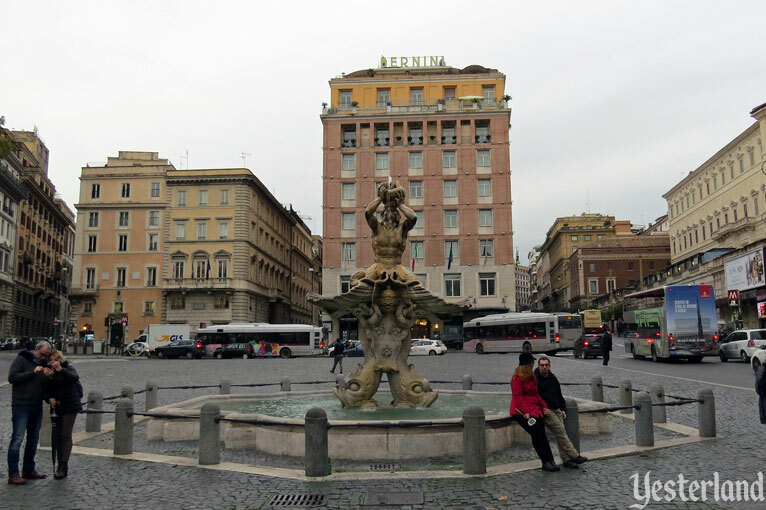 This Piazza even has a luxury hotel with BERNINI on its roof, the Sina Bernini Bristol. 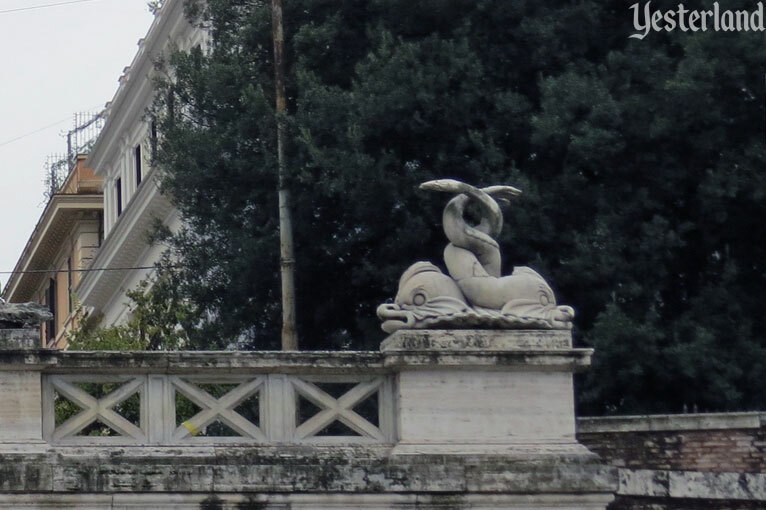 Triton, kneeling on the tailfins of four Bernini dolphins, is blowing a particularly large conch trumpet. It spouts water. The work was executed in travertine during 1642-43. So far, this photo journey has included Neptune and Bernini—but not Neptune by Bernini. We can fix that by hopping over to London. One of the many treasures on the Victoria and Albert Museum in London is a marble fountain sculpture of Neptune and Triton. It’s a genuine Gian Lorenzo Bernini work, made around 1620 for art patron Cardinal Alessandro Peretti di Montalto in Rome. It’s been in England since 1786 and in the collection of the “V&A” since 1950. Apparently, Neptune lost his trident in the process. From England, this photo journey now recrosses the Atlantic Ocean and crosses the North American continent. Next stop, California. The Getty Center in Los Angeles has a 22-inch reduction in bronze of the Bernini sculpture in London. Instead of Triton below Neptune, there’s a dolphin. This Neptune still has his trident. 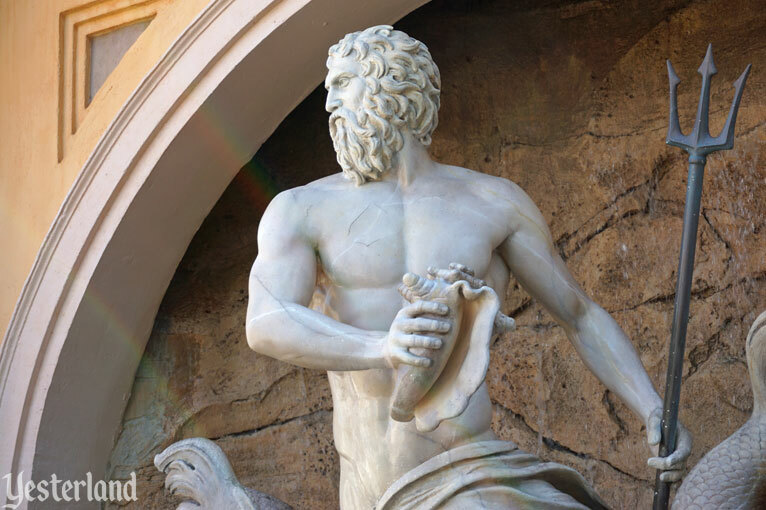 It’s likely that the Disney Imagineers responsible for the Neptune fountain at Epcot studied not only the works shown in this article, but other sculptures of Neptune by other artists in cities including Florence and Bologna, as well as other works by Bernini. The primary nod to Bernini in the Imagineering Field Guide to Epcot is legitimate—because Bernini defined the Baroque style of sculpture for the artists who came later. Despite being a new work from the late 20th century, the Fontana Di Nettuno at Epcot is a fine work in the Italian Baroque tradition. It would look right at home in a historical setting somewhere in the real Italy. Now that we’re in Southern California, we should head to the Disneyland Resort, right? So far, this article has mentioned a number of rulers of the seas—Poseidon, Amphitrite, Neptune, Oceanus, and the merman Triton. 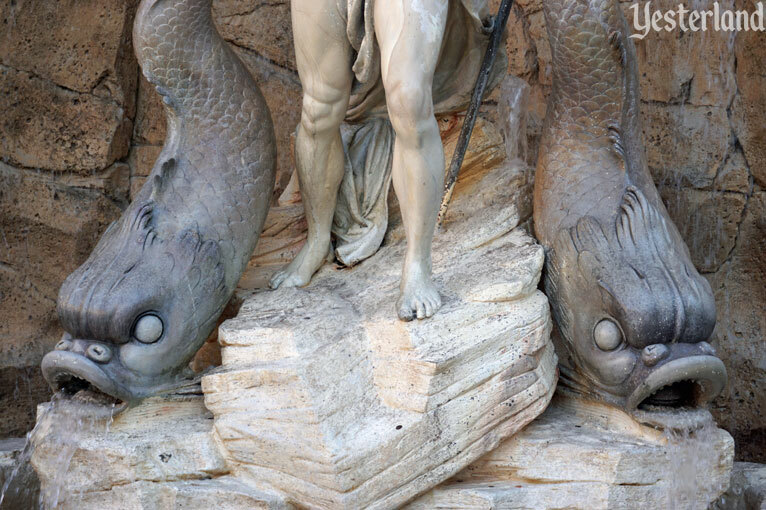 There’s another merman named Triton with a particularly strong Disney connection, as well as a tradition of being represented in sculpture. 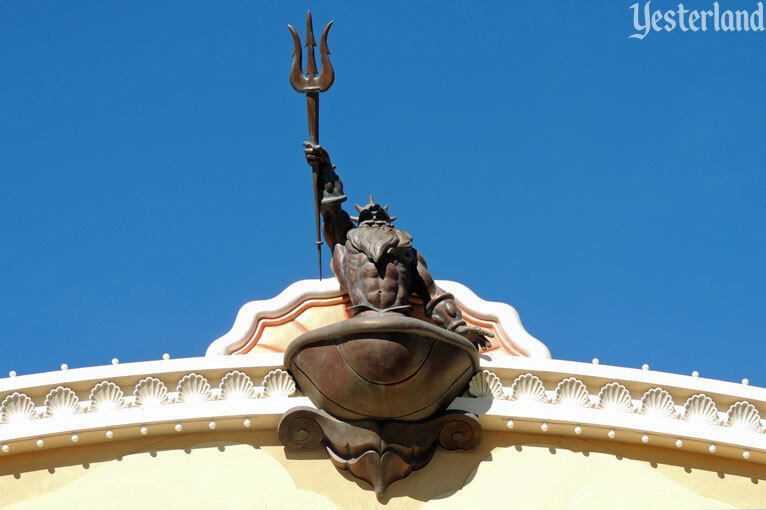 It’s King Triton from The Little Mermaid, who figured prominently in fountains at Triton’s Garden at Disneyland and Ariel’s Grotto at Magic Kingdom Park. Those fountains are gone, but King Triton now has a great view of World of Color every evening from his vantage point atop The Little Mermaid: Ariel’s Undersea Adventure. 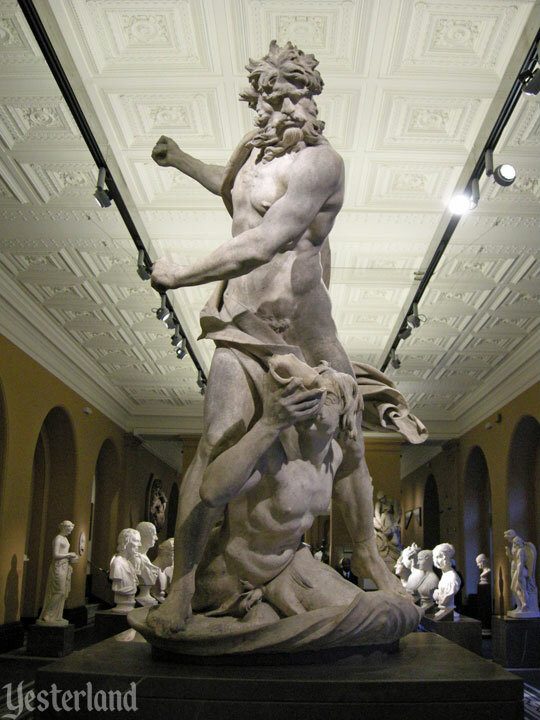 You won’t be surprised that King Triton is not a Bernini.